For the past 10 years or so, we've gone to my sister and brother-in-law's house on New year's Eve. We eat, drink and play games (I remember a particularly noisy game of Pit last year). Since they are in Vegas this year, we had a change from the norm. We decided to eat dinner at Bottleworks. One of the featured specials tonight was crab cakes...yummo. In addition to the usual onions and red peppers, these crab cakes had andouille sausage in them. Double yummo! There are only 14 minutes left in the year 2007. I'm standing by to start the countdown. One of our favorite restaurants, Copia Urban Winery, was destroyed by fire early this morning. Luckily, no one was injured. Arson is suspected as the cause of the fire. Click here to read the entire story. We've eaten at Copia many times. You can read about our first visit by clicking here. The owners are planning to rebuild and we will be sure to visit as soon as they reopen for business. Most of the stamping I've done for the past two or three weeks was Christmas related. I did take a few minutes to create something non-Christmasy a few weeks ago but I didn't have a chance to photograph and post it until now. I had bought this stamp about a month ago and it sat on my stamping table for about a week before I used it. I know, that's just terrible. A new stamp should always be inked within hours of purchase...hee hee hee. Anyway, this stamp is from Lockhart Stamp Company. I love cupcakes so I just had to buy it. 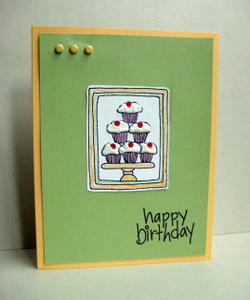 I started with Apricot Appeal for the card base and layered a smaller piece of Certainly Celery on top. I stamped the image on Whisper White and used my @Stampin' Up markers to color the cupcake papers, platter and frame. I added liquid applique for the icing and sprinkled Dazzling Diamonds on top for some sparkle. I punched 1/8" circles out of Real Red card stock for the cherries. Three Apricot Appeal brads were added to the top left side and the sentiment was stamped in black in the lower right corner. All card stock, ink and accessories are @Stampin' Up. Sentiment by @STM. I'm working tomorrow and then I'm off for four days! Woohoo. I'm planning to spend at least a few hours each day stamping, of course. I hope everyone had a very merry Christmas. 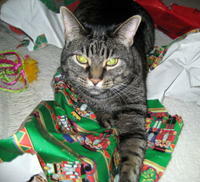 Here's a picture of our kitty, (the reason we don't have a Christmas tree) Greta. She looks so calm and quiet...ha! Two seconds after this picture was taken, she was running through the house like she had lost her mind...hee hee hee. Oh well, that's ok because she's so cute!!! Believe it or not, she has figured out how to open the glass fireplace doors; but that's a post for another day! I don't have to go back to work until Thursday...na, na, na, na, na!! I really need to straighten up my stamping room as it's a mess right now. I need to put away all of my Christmas stamps and start focusing on spring. Maybe I can just skip over January and February and go straight to spring. Wishful thinking! Last but not least is the card I created for family this year. I started designing this card a few months ago. I was aiming for a clean and elegant design and I kept going back and forth on which color green to use. I knew I wanted to use Bravo Burgundy for the base and I finally decided on Garden Green. I cut a piece of Metallic Gold card stock slightly smaller than the base and used the @Stampin' Up ticket corner punch on the corners. I then cut a slightly smaller piece of Garden Green, used the ticket corner punch again and layered it on top. 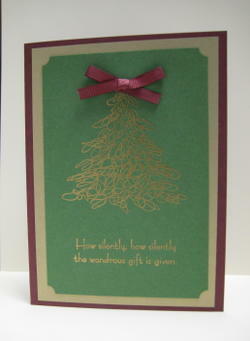 I used the tree image from Wonderous Gift, embossed it in gold and then added a piece of burgundy grosgrain ribbon tied in a bow for the top of the tree. The sentiment is also from Wonderous Gift and was embossed in gold. All card stock, ink, images and accessories are @Stampin' Up. We're going over to my sister's house this afternoon to celebrate Christmas. They'll be out of town on Christmas so we are celebrating early. All of the presents are stacked and ready to go. I just need to get the platter of Christmas cookies arranged and wrapped. I hope you enjoyed my Christmas creations this year. This is the card I created to send to friends this year. I started with a card base of Bordering Blue. I cut a slightly smaller piece of Night of Navy and embossed it with my Cuttlebug Snowflake embossing folder. I added a piece of narrow silver organdy ribbon and then attached the embossed layer to the base. I punched a square out of Bordering Blue using the Marvy Uchida Giga punch and a smaller scallop out of Night of Navy using the Mega punch. 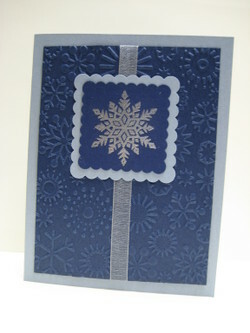 I embossed one of the images from the Snowflakes set in silver and then added the scalloped squares to the card. All card stock, ink, images and accessories are @Stampin' Up. This is the card that our monkey, um I mean our kitty, Greta, sent to Amber, my parent's puppy dog. You can't forget the furry members of the family. They like Christmas too...hee hee hee. I used Wild Wasabi for the card base. I love this color and will be sad to see it go when it retires in July as it's such a pretty shade of green. I'll have to be sure to stock up before it's gone. Anyway, I layered a smaller piece of Real Red on top. I stamped one of the images from Here Kitty Kitty on Very Vanilla and used my Prismacolor watercolor pencils to color the kitty. The hat was stamped in black on Wild Wasabi and embellished with red Stickles. 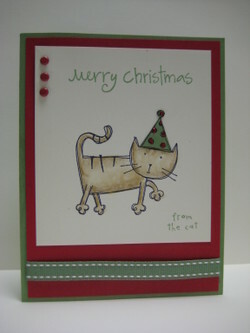 I then stamped "Merry Christmas" and "from the kitty" in Wild Wasabi. I added Real Red brads and Wild Wasabi stitched ribbon to complete the design. All card stock, ink, accessories and images other than "Merry Christmas" are @Stampin' Up. "Merry Christmas" by Kate & Co. It's a little difficult to make a card for a 13 year old boy. Of course it can't be "cute" or "childish" and it definitely can't have flowers of any kind. 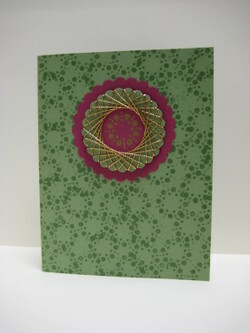 That being said, I used Glorious Green for the card base and then layered a slightly smaller piece of Real Red on top. 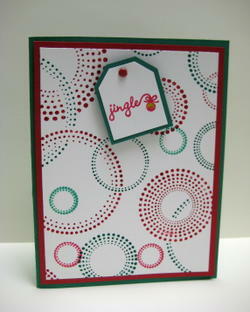 I chose the On The Spot background stamp used my @Stampin' Up markers to ink half of the circles with Glorious Green and the other half with Real Red. I stamped the image on Whisper White and layered it on top. I stamped the jingle image from Perfect Endings in real read, colored the bell with a gold metallic marker and punched it out using the @Stampin' Up small tag punch. I punched another tag from Glorious Green card stock using the large tag punch and then layered the stamped image on top. I added a Real Red brad to the top of the tag and then attached it to the card using a foam dot. All card stock, ink, images and accessories are @Stampin' Up. Day Two in my "Week of Cards" - This is the card I created for Sarah. I used Wild Wasabi for the card base and I stamped one of the images from the Snowburst set in Wild Wasabi ink all over the base to create the background. I punched a scallop circle in Purely Pomegranate using the Marvy Uchida Giga scallop punch and a smaller circle in Wild Wasabi using the Mega scallop punch. I wrapped gold cord around the smaller circle. I stamped the same image I used for the background on Purely Pomegrante and embossed it in gold. I punched it out and inserted it into the middle of the smaller circle under the edges of the cord. All card stock, ink, images and accessories are @Stampin' Up. As promised, today is the first entry in my "Week of Cards" postings. I have two nieces and one nephew so I wrote their names on pieces of paper and then drew the names to determine which order to post the cards. Amanda is the lucky winner. This is the card I created for her. I used Shimmery White for the card base. I stamped the snow blossom from In The Spotlight on Shimmery White using Night of Navy ink. I punched it out using the snow blossom punch, added a jeweled brad in the middle and attached it to the card using a foam dot. I wrapped silver cord around a piece of Night of Navy card stock, added a silver eyelet to the right side and then attached it to the card. 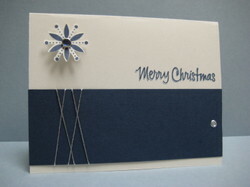 I stamped Merry Christmas in Bordering Blue and then stamped it again in Night of Navy slightly above the first image. It creates a shadow effect and gives it more dimension. All card stock, ink and accessories with the exception of the brad are @Stampin' Up. Jeweled brad by @Making Memories. Snow Blossom image by @Stampin' Up. Merry Christmas sentiment by Hero Arts.